P.S. The Monks were including this cover in their live sets years before Irwin or I knew who Scott was. Scott composed "Desire" — a "descriptive fantasy for orchestra" — to accompany a dance routine by Lilly Christine in legendary producer Michael Todd's lascivious Broadway production Peep Show. The staging opened at New York's Winter Garden Theatre on June 28, 1950 and closed February 24, 1951 after 278 performances. "In the days when a burlesque show only cost the customer 40 cents," mused reviewer Inez Robb's droll husband after accompanying his wife to a performance, "such a display would have been vulgar, lewd and nihil ad rem. But today, when Mr. Todd collects $7.20 for each and every orchestra seat, it is art and let that be a lesson to you." The Scott brain trust (six or seven of us) have yet to discover a recording of this work. If you have one, join the trust. Thanks to Takashi Okada for the scan. 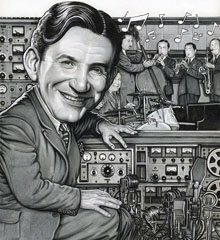 As a bandleader, Raymond Scott demanded perfection from his sidemen. His standards were so lofty he once said he wouldn't hire himself to play in his own bands. In his pursuit of musical perfection, he eventually did away with human players, and built electronic devices to generate music. 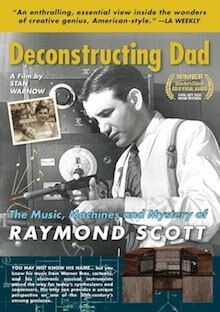 With Stu Brown's Raymond Scott Project, talented musicians are restoring the human touch to Scott's music, and doing it with elán. The composer would be impressed. He might have hired these guys. Brown brings his RSP to London's elegant new Kings Place cultural centre on October 14. 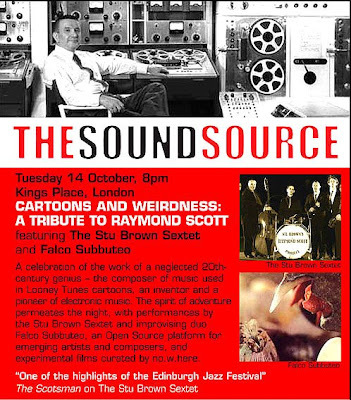 The program, Cartoons and Weirdness, presents a combined performance by Brown's sextet and experimental London duo Falco Subbuteo, exploring new interpretations of Scott's electronic and acoustic work. The evening includes excerpts from Stan Warnow's documentary-in-progress, some cartoon-related short films, DJ sets featuring Scott's electronica and derivative works that sample Scott. 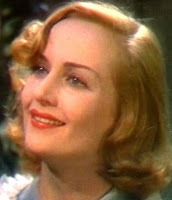 The beautiful and talented (and tragic) Carole Lombard was born a century ago today. That makes her less than a month younger than Raymond Scott, with whom she also shares a film: Nothing Sacred (1937). Scott and his Q compatriots headed west under contract to 20th Century Fox in late '37, less than a year after making their sensational Christmas 1936 CBS radio debut. Their first film assignment was a medley of familiar (non-Scott) tunes arranged in the idiosyncratic RSQ style, intended to accompany a cinematic fashion show. The Quintette is heard, but not seen, in the sequence, which occurs early in the film. The medley has never been commercially released, but if you see the film, you'll recognize the RSQ's unmistakable verve. Scott and his band spent less than a year in filmdom. The residency was both productive and frustrating. During this time Scott expanded his sextet into a small orchestra and recorded scores of demos (which survive, and are being prepared for CD release). At the same time, he deplored the vacuousness of the motion picture industry. Explaining why he left in 1938 and returned to New York, Scott said he hated Hollywood "because they think everything is 'wonderful'." Kicks or Treats? MONKS OF DOOM!